Photo source: Workers Party (PO) website. Any number of people in Argentina have come to the conclusion that the key figures in the government of President Cristina Kirchner—and, indeed, the president herself—are blind, deaf and dumb to any but their own narrow and self-serving interests. But if President Kirchner and her most radicalized supporters still have the use of any of their senses, then they should have seen the writing on the wall today (or at least felt and smelled it), because no message could have been clearer than the one transmitted by the general strike. As of the stroke of midnight last night, major national labor movements—some formerly antagonistic to one another but now united in a mutual cause (and most once pro-Kirchner and now dissident)—fostered a nationwide general strike that has today brought the country to a veritable standstill. Picketers set up roadblocks at principal entrances to the capital city of Buenos Aires and there were numerous other picket points erected throughout the rest of the country. Some 2,000 truckers parked their rigs along the roads near international border crossings as of sundown yesterday and anything else on unionized wheels, including garbage trucks, also ground to a halt on orders from powerful teamsters boss Hugo Moyano, who, as head of the traditional Peronist General Confederation of Labor (CGT), is one of the chief architects of the general strike. Municipalities asked neighbors not to set out their trash for collection, but refuse was already piling up in the streets of Buenos Aires and other cities by noon today and won’t be picked up before Thursday, if then. Domestic flights were grounded nationwide. Dissident union workers on some train lines joined the strike, halting train services on those lines completely, while rail services whose workers didn’t adhere to the labor measures were also disrupted as a result of blockades set up at level crossings. Banks remained closed everywhere in Argentina today, and by this afternoon there were concerns about ATMs running out of cash, since they haven’t been serviced since early yesterday and won’t be again until tomorrow at the earliest. Most city buses ran in Buenos Aires but ended up having their routes blocked by protesters at different points around the capital. While most subway lines were operative, workers on the B-line (a major service running through the center of the city) joined the strike. Many service stations were shut down and fuel transport was blocked. Hospital services were severely affected and were reported in many cases to be operating on an emergency-only basis. National, provincial and municipal workers weren’t unanimous in their adhesion to the strike, but these services were clearly affected all over the country, if not by the strike as such, then by other disruptions resulting from the national shutdown. The 8N Connection. It would be incorrect to claim that today’s general strike was a direct continuation of the massive nationwide“8N Protest” that took place less than two weeks ago and that spontaneously mustered hundreds of thousands of mostly middle class individuals through the social networks to join together in town squares at home and at Argentine embassies abroad in protesting against corruption, insecurity, constitutional “reform”, unilateral policies and the generally autocratic style of Mrs. Kirchner’s government. Indeed, many of the well over a million people who thronged into the streets for that demonstration are the kind who would shrink from Big Labor general strikes on principle, who don’t trust the likes of ambitious militant labor bosses like Moyano and leftwing CTA (Argentine Workers Central) leader Pablo Micheli, among others, and who believe in the constitutional right to strike and protest, but also in the right to freedom of movement and choice and are thus put off by any protest that includes setting up roadblocks to keep those who want to go to work from getting there. In fact, at the gathering points for the November 8 protest there were repeated scenes of whole columns of middle class protesters stepping off to the side of the street to let vehicles pass and of their holding up at stop lights so as not to break the flow of traffic. And there were repeated reminders too in the messages they exchanged in the run-up to the protest to avoid causing any sort of damage on the protest sites, to respect public and private property, not to allow themselves to be provoked by opposition activists, in short, to remember “that we’re not them,” in reference to the self-serving riots that Kirchnerist activists have seldom been above promoting. But, that said, there are obvious parallels between the two protests and one has also clearly led to the other. Today’s general strike confirms reports from right after the 8N Protest that Hugo Moyano was secretly meeting with other “orthodox Peronists”(perhaps including former President Eduardo Duhalde) to discuss ways to keep pressure on the Kirchner administration that was not only ignoring the needs of at least half the population that opposed it, but also those of groups that had indeed lent their support to Mrs. Kirchner and to her late husband in their combined decade in office. Moyano was already reportedly pressuring the late President Néstor Kirchner to reciprocate before Cristina Kirchner was elected. And although he had been widely considered a “friend” of the administration’s during much of the current president’s first term, his grumbling has become increasingly boisterous since and has recently turned to open dissidence. The 8N Protest provided Moyano and Micheli with the test case they needed to gauge the political and social climate in the country. Unlike President Kirchner, they are clever enough not to believe their own hype, to know what they are looking at when they see a million people march peacefully into the square in front of Government House to tell the president that they will no longer be the silent “minority”.They are also clever enough to know that most of those people were middle class wage-earners—rather than “well-dressed demonstrators”, as Mrs. Kirchner has referred to them in an attempt to disqualify their demands as greedy—with a lot of the same problems facing the blue-collar workers that their organizations represent, such as ever-increasing tax pressure on the working classes, abysmal retirement pensions and low basic wages that are all artificially justified by the administration through blatant manipulation of government statistics, savings options and foreign exchange rates. And these are all issues that were part and parcel of both the 8N Protest and today’s general strike. The strike’s swift organization in the wake of 8N goes to show that Moyano and Micheli properly weighed the power of that other protest and wanted to strike while the iron was hot. Strange Bedfellows. An idea of how well that worked for them was provided by Argentine Agrarian Federation chief Eduardo Buzzi, who, despite having formerly been a bitter foe of Moyano’s as well as of the Kirchner administration, threw in his lot with the CGT and CTA today and was rewarded with an estimated 80 percent participation in the national strike by the mostly small farmers that he represents. Buzzi said that the roadblocks had been a lot fewer than expected because they simply weren’t necessary. He said that in rural Argentina, people “joined the strike of their own accord,” quipping that out in the country “when things are quiet, we say not even the birds are flying,” adding that the strike was so well received that last night, after midnight, when it first began and before any roadblocks were set up, “even then, not even the bats were flying.” While saying that he was willing to wait and see if the government would now come to its senses, he characterized the Kirchner administration’s attitude up to now as that of “an autistic government that ignored social outcry” in successive protests. 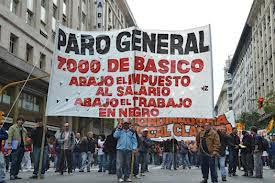 CTA boss Pablo Micheli, for his part, defended the roadblocks set up from 7 a.m. until noon in Buenos Aires saying that this was a government that tolerated the fact that half the workforce was black-market (sweatshop) labor “who have no right to strike because if they don’t go to work they’ll simply be fired”. The roadblocks, he said, provided them with the instrument they needed to stay home, because it allowed them to say that they were unable to get to their jobs. Cristina - on her own. Cristina without Néstor. While perhaps a tragic loss at a personal level, the death of her husband in late 2010 turned out to be a political boon for Mrs. Kirchner in her campaign for reelection the following year, with some political analysts having suggested that this (along with the anemic showing of the dubious opposition) helps explain her sweeping triumph when it came time to vote. And it also explains, to a certain extent, why Peronist labor has held off this long, before putting any real teeth into its express demands. As I mentioned here last week, Moyano is reported to have told other dissident Peronists following the 8N Protest, “I said I’d give her a year (and) that time’s up,” in reference to the wait-and-see period he declared for Big Labor after Néstor Kirchner’s death and Mrs. Kirchner’s reelection, in which to see how she would perform on her own, without her husband’s rather too obvious behind-the-scenes influence. 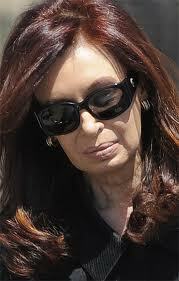 At the time of Mr. Kirchner’s death, in an article that I published here, I suggested that the current president was facing a situation not unlike that of Isabel Perón, who was unceremoniously launched into the presidency following her husband’s death in 1974, with absolutely no skills to prepare her for the job. Though I clarified that Cristina was obviously not Isabel—who was sorely unequipped to do anything but lend the Perón name to her handlers and do as she was told (with disastrous results), I was taken to task by more than one reader for even mentioning Isabel in the same breath with President Cristina Kirchner. But my analysis from that time has, unfortunately, proven prescient, since I predicted that in the power vacuum that would follow Néstor’s death, she would face similar pressures for shared power to those brought to bear on Isabel Perón, and where Isabel was simply too ill-prepared to ward off disaster, Mrs. Kirchner would very likely prove too arrogant and opinionated to reach the kind of compromises her office required, without her husband there to temper her willfully autocratic bent—an attitude which has led her to shed some of the better aides in her government and to surround herself with a number of mindless yes men, wheeler-dealers and unmitigated buffoons. I also predicted that, with Néstor gone, she would either be forced to share a certain amount of reciprocal power with Peronist labor in general and Moyano in particular or face having them as her enemy. Today’s general strike—the first that the CGT has organized against the government in nearly a decade that the Kirchners have been in power—would appear, sadly, to confirm my theory. Pre-8N/Post-8N. What the president needs to realize is that she can’t turn the clock back to before the 8N Protest. The rest of her presidency—and indeed the entire Kirchner era—promises to be marked by that event, with a line of demarcation being clearly drawn between the pre-8N and post-8N periods. Between that protest and today’s national strike, her end-analysis should be that she has “lost the street”—a factor that her late husband obviously knew he had to control in order to govern unfettered—as well as her “majority-rules”status, and that if she hopes to avoid increasing pressure, undermined governability and eventual chaos, she will have to start listening to the voice of the people as a whole and begin seeking consensual solutions instead of facile excuses and arrogant self-justifications.